Gambia House constructed 1968, 20 stories, 115 flats. Owned and managed by Islington. Planning proposal for external cladding, 18 Sept 2014. Eagle Dwelling 212 City Road, on the left of the picture, is a “specialist supported housing scheme for single homeless people who may also have additional complex needs”. It seems to be owned and managed by “Family Mosaic”, a private company, who recently merged with Peabody. The Royal Star, the “BAR” in the picture, is a pub which serves food. 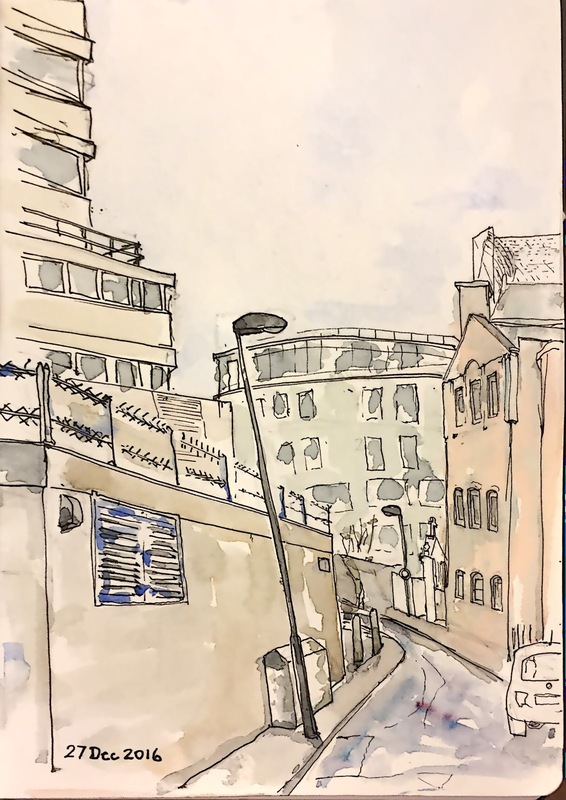 This picture drawn and coloured on the corner of Shepherdess Walk and Nile Street, Islington EC1. Very cold and windy. About one and a half hours. The view looking West through the Millennium Bridge. 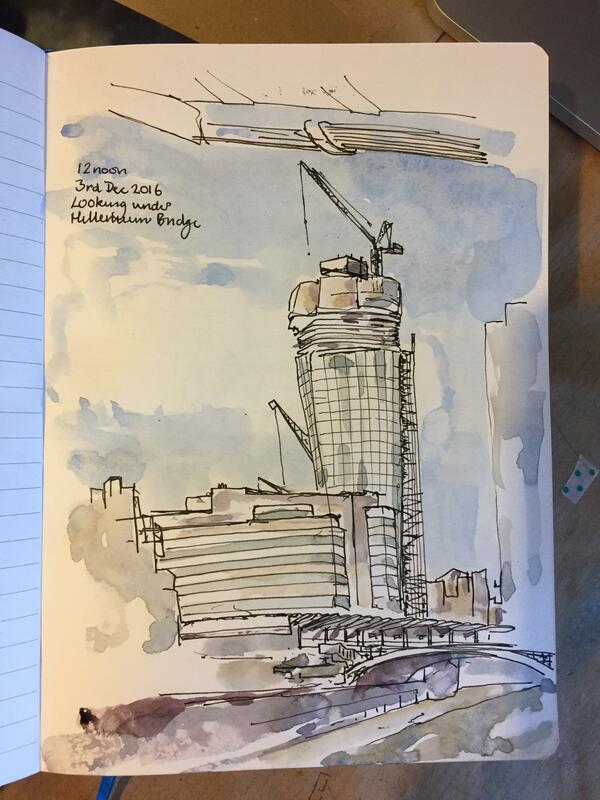 Drawn from the Thames foreshore. About 45 minutes + coloured later. The tall tower is 1 Blackfriars. It still has a way to go up. A sunny day near Leicester Square tube station. The view from an office window, Tower 42 on the left. 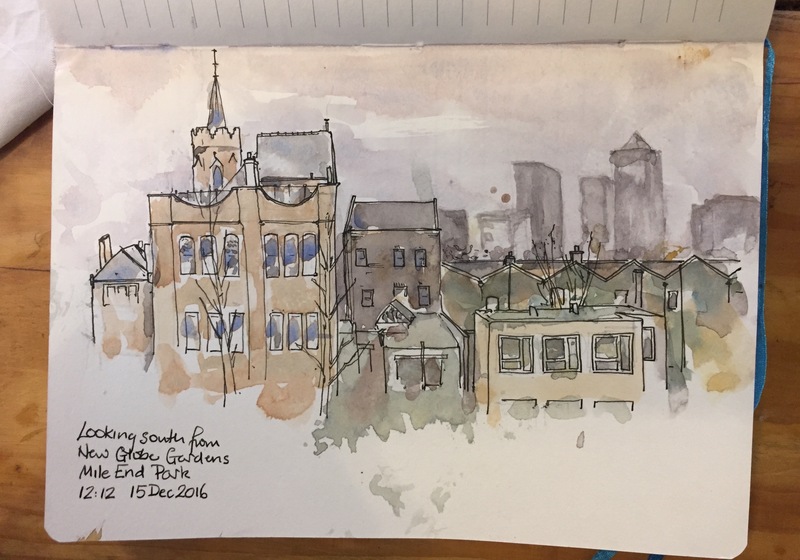 This was sketched from indoors, nice and warm. The challenge was to avoid getting watercolour spots on their pristine office furniture. The view “above Great St Helen’s”, shows what you see if you look up towards the North from the Aviva building in Undershaft, near the Gherkin. The cupola is above St Helen’s Place, 62-69 Bishopsgate. 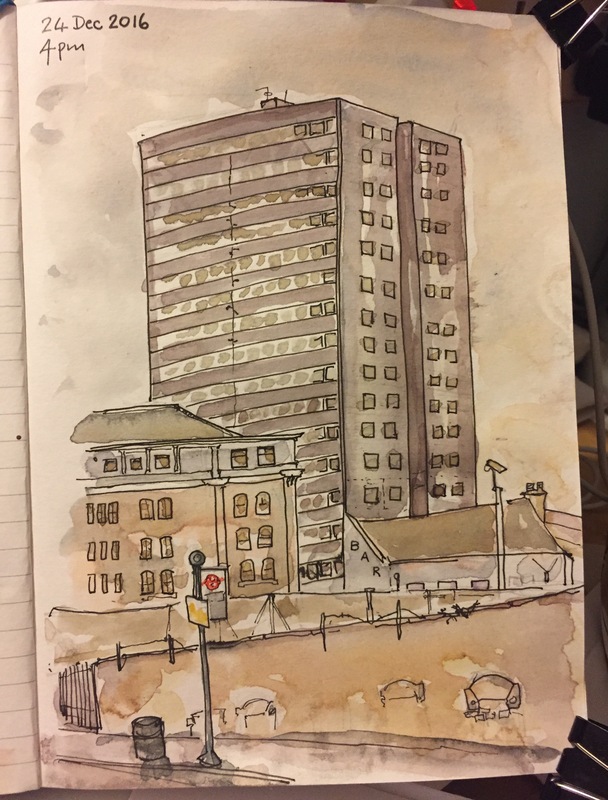 This sketch done standing up, in the cold. Coloured later. 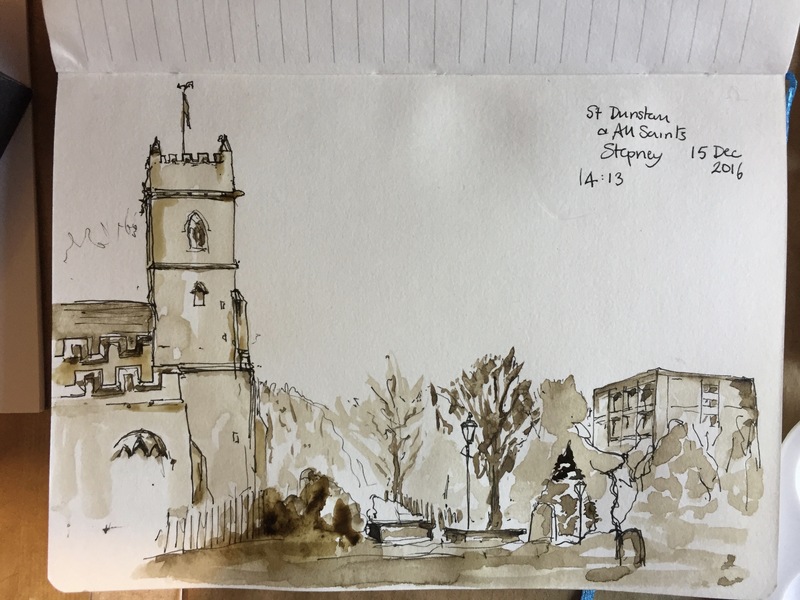 Two sketches, both from Preacher’s Court, The Charterhouse. One shows the view looking South West, past the new accommodation block. The other looks North East towards the John Vane Science Centre of Queen Mary, University of London campus. The new accommodation block in Charterhouse was built in 2000, designed by Michael Hopkins and partners, architects also of Portcullis House. It is called “The Admiral Ashmore Building”. The John Vane Science Centre houses, amongst other things, the London Genome Centre. In the Charterhouse, the leaves show Autumn colours, untroubled by wind, in the enclosed courtyard. It was still very cold. I sketched there from 09:30 to 12:30.